Popular Close Curb Fine 9ct White coloured Gold Trace Chain. 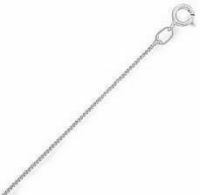 Excellent White Gold Trace Chain for use with pendants or as a simple understated elegant White Gold Necklace worn alone. Length 410mm (16 inch) by approx. 0.5 Close Curb gauge links. 9 carat Gold Trace tight Curb link Neck Chain in White colour Gold and popular 16 inch necklace length.